Short and sweet– I got tired of people always promising recipes of crispy baked this — crunchy baked that — only to try it out and get the same ehhhhh results. Problem solved! 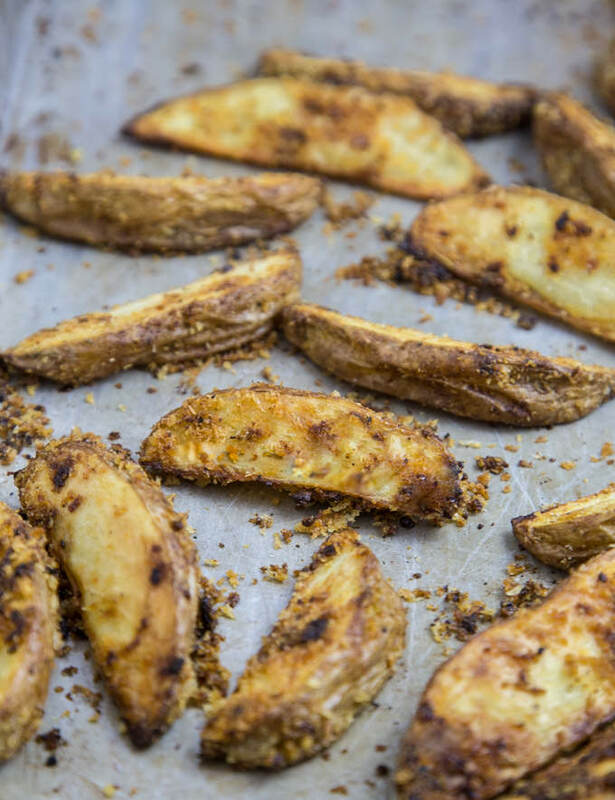 A quick and easy recipe that will give you the crispiest baked wedges that you’ve ever had. The secret is quite literally in the sauce. The idea for these came from my die-hard love for battered fries. You know the ones. You’re at a restaurant and they bring you the fries that have perfectly steamed, fluffy inside, crunchy on the outside french fries with that special extra something. Odds are, they are battered. If you don’t want to fool with that at home, or don’t want the couple extra calories from deep-frying, this is going to be your new best friend. The secret to crispy baked fries is to coat them with seasoned fine panko crumbs using a bit of Southern gold as the binder– Good ol’ Paula’s butter. Just a bit. Enough to coat the fries and attach the crumbs. I’ve been playing around with these, and have had great success with all kinds of great seasonings for some variation. “Honey. 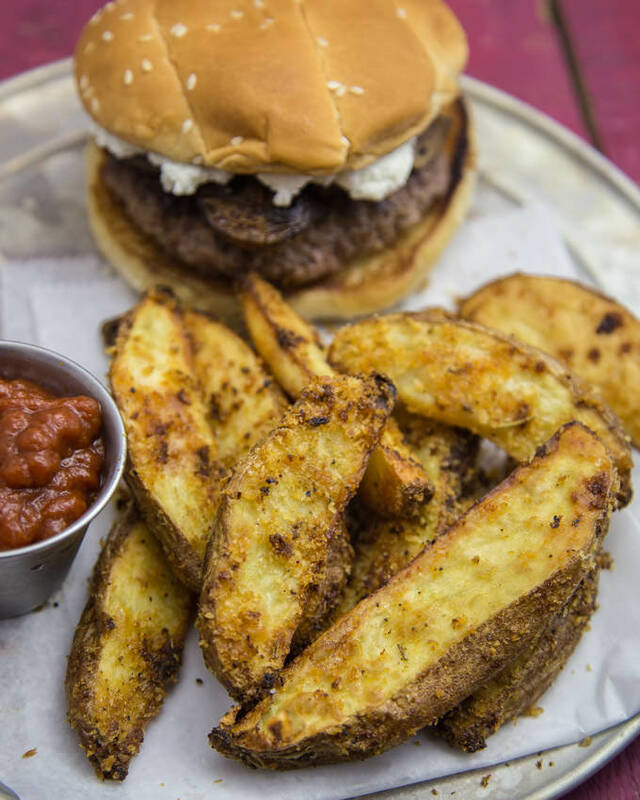 We have to make fries again because I have a couple other seasoning ideas.” — Sounds like a good enough reason to me. 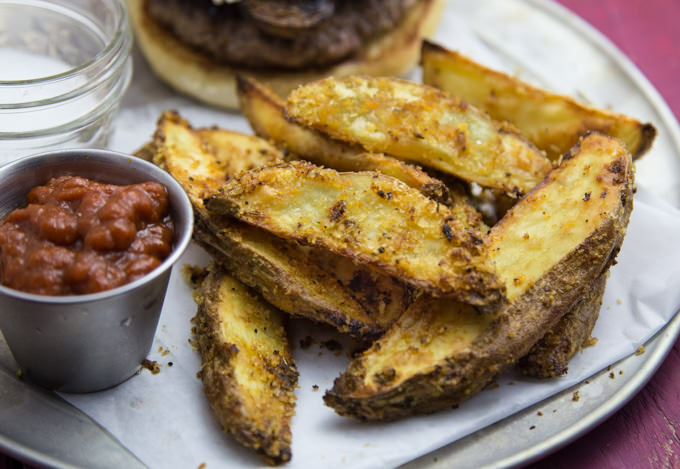 Crispiest baked potato wedges recipe by Southern FATTY. Pre-heat oven to 450 F. Line baking sheet with parchment. Combine all spices and seasoning into food processor with panko crumbs. Add wedges and melted butter into gallon bag. Add melted butter and toss well. Take each wedge and a small handful of the seasoned crumb and press around wedges to heavily coat. Bake for about 25 minutes, flip carefully, bake for another 10-15 minutes until both sides golden. Thanks for the compliments! I cook Indian food a bit, and have that in my kitchen already. I’ll give it a try! Sounds great. That’s an interesting solution to the problem of making crispy baked fries. Thanks! Butter always makes wedges taste 100x better, especially when they’re as crispy as these guys look. Hope you enjoy! Let me know how it goes.